River Alliance of Wisconsin is preventing the spread of aquatic invasive species by installing educational signage and wader wash stations across the state. This work is increasingly important, as Wisconsin faced the news of New Zealand mudsnails spreading to two new streams at the close of 2018. Invasive New Zealand mudsnails were first discovered in Black Earth Creek in 2013, and have spread to five new locations, all within Dane and Columbia counties: Badger Mill Creek (2016), Rowan Creek (2017), Mount Vernon Creek (2017), and most recently the Oregon Branch of Badfish Creek (2018) and Brewery Creek (2018). Providing anglers with wader wash stations so they can more easily practice clean angling is an important step in the fight against this prolific invasive species. As we move into 2019, we will “re-boot” the wader wash station program, adding more options, updated signs, and station maps. To make this program a success, River Alliance needs you! Find – Participate in a “station scavenger hunt” to help us confirm locations and conditions. Report – If there is a station that is not on our inventory we need to know. 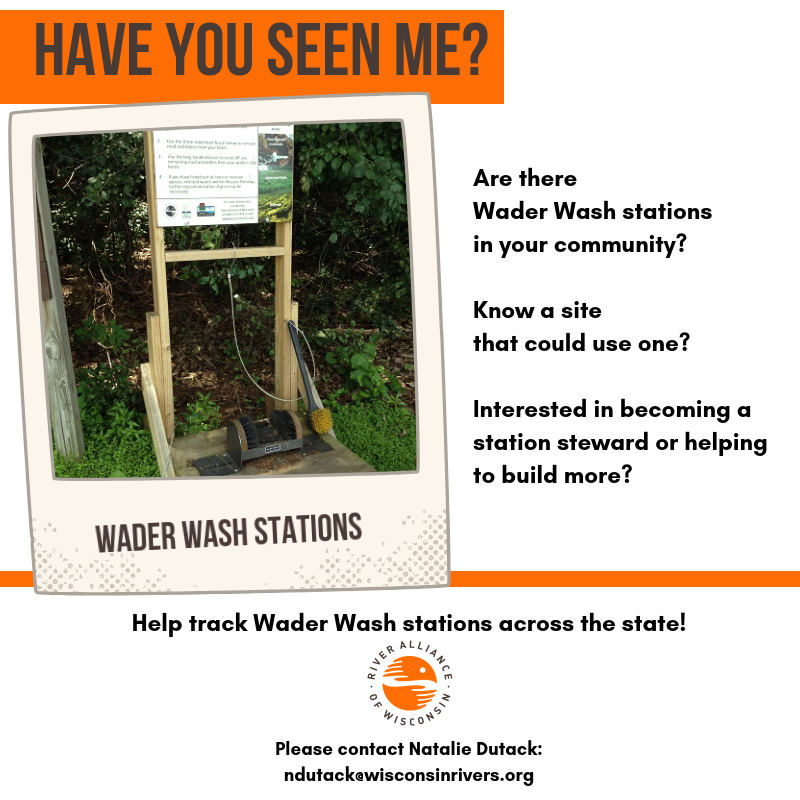 Help us find any missing locations so we can help partners maintain wader wash stations. Adopt – Some stations need stewards. We will seek to place these candidates with groups who can maintain them through our “Adopt-a-Wader Wash Station” program. Suggest – Your information on stream use can help us identify new locations that need wader wash stations in 2019.